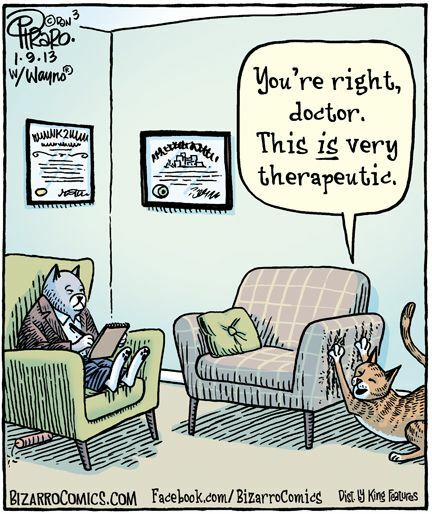 Do cats get depressed? 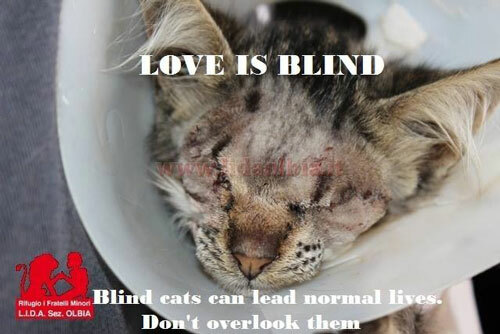 They do – how you can help. The recent suicide of comic genius Robin Williams has gotten a lot people talking about depression and keeping a closer eye on friends and relations who suffer from depression. But what about our cats, do they sometimes get depressed? Well, they do. Generally feline depression can be overcome fairly quickly. So many things can trigger it. A death in the family (and that can be family with two feet and no tail, or four feet and a tail) is a big one. Cats can mourn anywhere from a few hours or days, to weeks into months. Any big changes to the home can be a trigger. If your cat feels neglected depression can set in. Many years ago when we brought Torti home, our other tortoiseshell cat Tasha, let out a cry that was more like a wail a heartbreaking sound that we’d never heard before or ever heard again. It was as if she thought she was being replaced with another cat that looked like her, but was younger. It took loving work, but Tasha snapped out of it a week later and the two girls became inseparable until they both crossed The Rainbow Bridge. Not eating at all or eating much less than usual is number one. Hiding. Not engaging with you or the other cats. Your cat could start to sleep noticeably more. Your cat could become very quiet, not meowing, or purring. On the flip side of that your cat could start to yowl which is comparable to us sobbing. They may become aggressive towards you or others in the home. They might hiss or bite, or swat. They might stop using the litter box for either pooping or peeing, perhaps even both. The cat may use the litter box but might not bury their droppings. Loss of interest in toys, and affection from you. Here is how Cat Faeries can help you to help your depressed cat. A Ball of Twine, a calming music CD created just for cats to be played while you are not at home. The composer has studied the effects of sound on the brain, heart, and cells of the body so this music is truly medicinal. Comfort Zone with Feliway – Diffusers can be installed in the room or rooms that this cat spends the most time in. That pheromone was intended to stop cats from peeing outside of the box but when it was created in the late 1990’s it was discovered that it calms cats and snaps them out of funks. 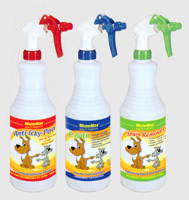 Catnip Mist can be sprayed on your cat’s bedding or favorite resting or hiding places. 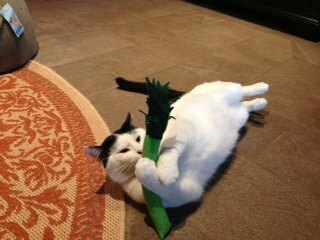 Most cats find the aroma of catnip hard to resist! Our flower essence formulas. So many good ones to choose from: Moves and Changes, Calm and Serene, Multi Cat Household, Past Abuse, Forget Me Not (for mourning). One formula can go into the food and/or water bowl while another one is lovingly massaged on the cat’s head and ears. A few years ago we posted an article about how you can help fire fighters save cats caught in fires by donating specially sized oxygen masks for animals (we’ve posted a link to that at the bottom. Here’s a photo from our local newspaper featuring a fire in the town of Weed, in Northern California (you can imagine the jokes that town gets!) 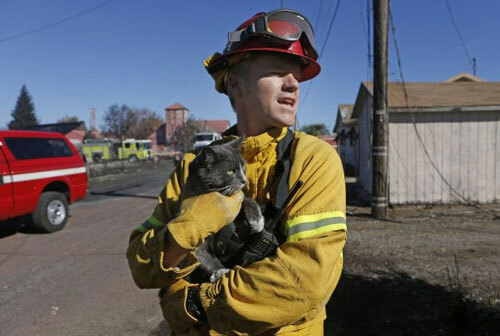 of a fireman holding a cat he found during the big wildfire several days ago, after one of many homes burnt. The cat looks a lot like our Madeline who was born in that region and came from a shelter 40 miles away! A cousin? Maybe! A big salute to fire fighters! “That fire was coming in here pretty good,” said Zach Curren, a firefighter from Napa, who worked the blaze near Angel Valley Road. “But we managed to stop it right there,” he said, pointing to a long, white ranch home with a crew of firefighters spraying down a smoldering roof. In his arms he held a gray cat he had just found hiding under a pile of clothes in a house across the street from the smoking home. The neighborhood was deserted except for fire crews, and as the whoosh of hoses and grinding of engines filled the air, the cat shivered. About two years ago we posted an article to our blog about how you can help firefighters help cats by donating specially sized oxygen masks for animals. 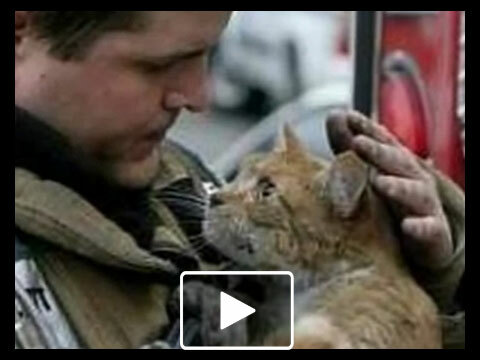 This photo is from a video that is an extremely moving collage of fire fighters rescuing cats from fires. The music is great! You’ll need much tissue! You can watch all of the video on our blog post on the oxygen masks. Here’s our blog post – Your local fire department needs specially sized oxygen masks for animals to save the lives of animals. How you can help! Last year we donated two of these oxygen masks to our closest fire house. One is cat sized, and one is dog sized.